For the last few weeks I have been walking with a Buddhist Monk, or more correctly several Forrest Monks of the Theravada Buddhist monasticism. Thist has proved to be a much more interesting experience than I first anticipated. There are enough experiences to cover several blog posts. Perhaps I should state at this point that although raised a Christian, I now class myself as agnostic. I could never truly become a believer in Buddhism, but I will admit, these guys have impressed me a lot. I have a great deal of respect for them. The suggestion came from Phat, our tour guide and my partner in life. She sensed that I was feeling in a bit of a rut and was not getting the regular daily exercise that I needed. I was not riding my bike. The weather was too hot and there are no places close that we feel it is safe and relaxing to ride. I hesitated at this idea for a while. I was not convinced that the monks would be all that excited about me tagging along with them. They walk through the village, bowls in hand, accepting gifts of food for their one and only daily meal. The second thing that made me hesitate was that the monks did this walk barefoot and Phat thought that I maybe also needed go barefoot if I walked with them. To cut a long story short, the monks were actually enthusiastic about the idea of me walking with them and I was assured that protective footwear of my choice would be acceptable. It was all arranged. I needed to arrive at the nearby Buddhist Temple, or more correctly the Monastery, at 5:30 AM. Nin, Phat’s brother-in-law, was to meet me there and make sure I was taken care of. Phat and I arrived on the dot of 5:30 and Nin arrived about 15 minutes later. The first thing I learned was that they started walking from the monastery in two groups. One group headed south to the village of Ban Bu Makrut and the other group headed north to the village of Khok Prong. The northbound group starts walking a little before 6:00 AM and the southbound group starts at a fraction after 6:00 AM. I was to join the southbound group and tag along with Nin. We all walked down to the entrance to the Monastery and I quickly learned that there was an order in which everyone lined up. The more senior monks were closest to the temple, then the junior monks, followed by the helpers. That meant that I was closest to the road. The order was not done by age, but by length of time that a monk had currently served. When all monks and helpers were assembled the Phra Ajahn (Sir Teacher) arrived. As he arrived all the monks and other helpers squatted down with hands together in a manner similar to the Thai greeting. As Phra Ajahn walked past, each monk then rose to his feet and followed Phra Ajahn in single file. I was allowed to stand and did not need to bow to Phra Ajahn. The reason given by them was that I was older, stiffer, and a westerner. It would be better for my health and safety if I did not squat low with hands together. I did however voluntarily place my hand in the Thai greeting position as a sign of respect. To get an idea of the distance, I set my GPS tracker and tagged along on the end of the line. I quoted Phat as saying bintabaht as that is the closest transliteration I have heard. I can say it and the Thais understand it. It is also the way Phat pronounced it to me. It will however be called other names by westerners and can also be translated in may different ways. If I use the western terms, I generally get blank looks from the local Thais. For this article, I will list the most common variations I have heard spoken, or seen written, and list their source where possible. Bintabaht – In addition to it sounding very close to what Phat said, it is used by Allan Wilson on his blog. Obviously Allan has experienced many of the same things that I have in Thailand. Although we have never met him I am sure we could compare a notes on many experiences. A search of google for the word Bindabaht will bring up Allan’s blog, and lots of links to soi Bindabaht which is a red light district in Thailand. I would not expect to find any Buddhist Monk walking with their Alms Bowl in soi Bindabaht. Pindapata – Food received in the alms-bowl. Source – Glossery of terms in the Autobiography of a Forest Monk by Phra Ajahn Tate. This is also the one that gets the most searches from Google and delivers pages on the subject of giving food to monks, so I will use it from now on through the following articles. Probably one of the best explanations of Pindapata that I have found on the internet is this quote from The Palelai Buddhist Temple. Although this temple is based in Singapore, the tradition remains mostly the same here in Thailand. Technically Pindapata is the actual falling of the food, but the word Pindapata or Bintabaht is most commonly used by local village people of Khok Prong – Wichienburi in Thailand in reference to the process of offering food to the monks. 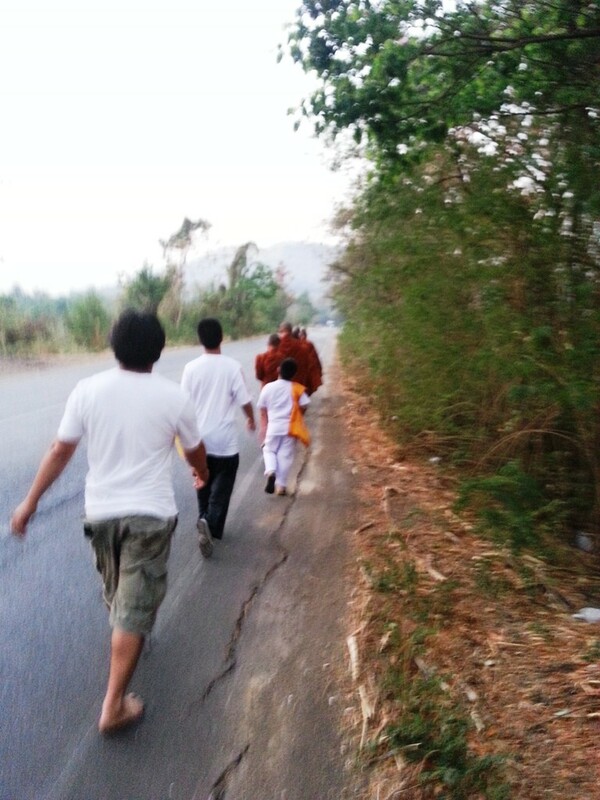 Ok I digressed a little so let me get back on the subject of my first walk, or Alms Round, with a Buddhist Monk. The walk from the entrance of the monastery to the village of Ban Bu Makrut is roughly one kilometre and nothing of special interest was noted on the first walk. We arrived at the village and I observed the process of the villagers putting food into the monks alms-bowls. Although I had observed this process before, it was from the other side. That is, I was squatting beside some local Thai village people as the monks walked past. I had helped put food into the bowl before but now I was viewing it from the other side. Being beside and behind the monks, I had the opportunity to observe things more closely and pick up more of the detail. 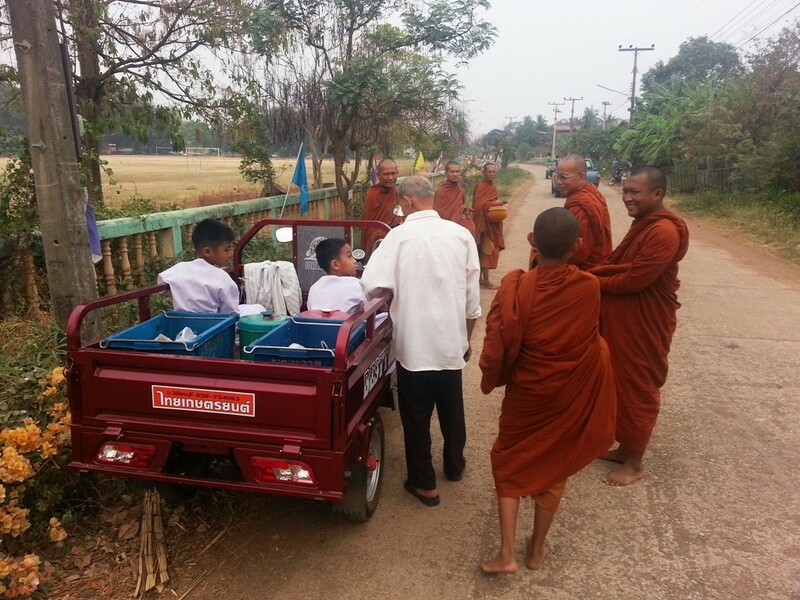 I was aware that there were helpers following the monks during their Alms Round but was not aware of exactly how, or in what way, they helped. The helpers consisted of Nin and one other young “layperson”. Once the alms-bowl or Bart as the Thais call it, (pronounced the same as the Thai Currency but spelled differently) was full, or if the Buddhist Monk was given a larger object such as a melon or a hand of bananas that were too big for the bowl, the helper/s would assist by placing the food in their shoulder bag. At the first intersection the monks split into three groups and I followed Nin and Phra Ajahan with one monk and one novice of about 16 years of age. At regular intervals there was another layperson on a motorised tricycle that was doing the rounds and picking up the excess food in a tipper type tray on the motor tricycle. It was when the tricycle arrived that it was pointed out that nobody had given me a shoulder bag to help carry the food. The man in the motor tricycle then handed me a plastic bag so I could help. From that point on I was assisting the Phra Ajahn, the Buddhist Monk and the Novice carry the excess food. The Phra Ajahn that I walk with, is well respected in the community and the village people give what they can afford. The amount and type of food will vary. It may be just a small handful of boiled rice for each monk. You may also see, a dozen mangoes, a hand of bananas, a watermelon (whole or sliced), UHT milk, fruit juice, home cooked spicy curries, home cooked sweets, shop purchased cookies or even fried or baked fish. It is often the case that the amount of food given far exceeds what a Buddhist monk could possibly eat in one meal, so some of the food is used for a pot luck breakfast at the monastery (more on that in a future article). A lot of the food, especially the packaged food such as milk and cookies, is given back to other village people as the monks continue their alms round. During the alms round I noticed that the milk and cookies were most often given back to the younger children. This observation was about to have a major impact on both myself and future alms rounds but I will save that for another post. We headed back to the monastery having walked 4.5 kilometers. Every Buddhist Monk did this barefoot. I may have managed possibly a kilometer on the cleaner and smother parts of the roadside, but there was no way I would have been comfortable doing the full distance over the rougher patches. I was more than happy that they suggested to me that I should wear something appropriate to protect my feet. At the time of writing this article I have walked almost daily for over two weeks and thoroughly enjoyed it. I have learned a lot. It will easily fill some more blog articles which should be written in the next few days.